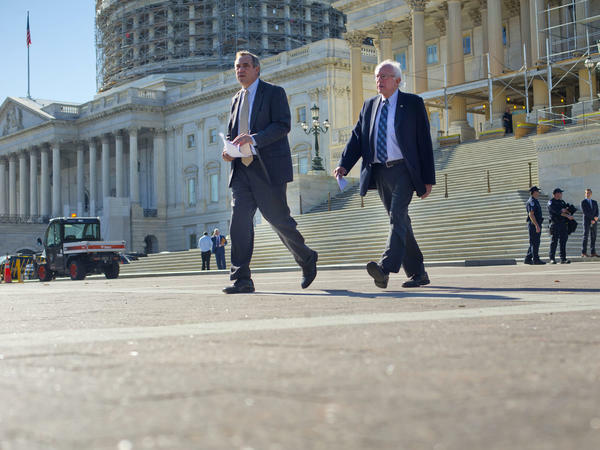 Democratic presidential candidate Sen. Bernie Sanders, I-Vt., (right) and Sen. Jeff Merkley, D-Ore., are shown on Capitol Hill in Washington, D.C., last November. Merkley has backed Sanders, which could help him in Oregon's May 17 primary. Oregon Sen. Jeff Merkley has endorsed Bernie Sanders for president, the first of Sanders' fellow members of the U.S. Senate to do so. In a New York Times op-ed, Merkley wrote that Sanders is "boldly and fiercely addressing the biggest challenges facing our country." Merkley praised the Vermont senator for opposition to international trade deals, his push for renewable energy, his calls to crack down on big banks, and his fight to address campaign finance laws. "It has been noted that Bernie has an uphill battle ahead of him to win the Democratic nomination. But his leadership on these issues and his willingness to fearlessly stand up to the powers that be have galvanized a grass-roots movement. People know that we don't just need better policies, we need a wholesale rethinking of how our economy and our politics work, and for whom they work." Merkley avoided taking any direct jabs at Hillary Clinton, Sanders' opponent, writing, "Unlike the Republican primary circus, Democrats have a choice between two candidates with lifelong track records of fighting for economic opportunity and who are committed to America's being a force for peace and stability and who are eager to meet today's challenges and move our country forward for all its citizens, together." While Merkley's endorsement is Sanders' first from a sitting U.S. senator, Hillary Clinton has racked up about 40 endorsements from U.S. senators — including every Democratic woman in the Senate except Elizabeth Warren. Clinton also has scores of endorsements in the House of Representatives, while Sanders has fewer than a dozen. Members of the House and Senate make up large portions of the Democratic superdelegates, so this gap explains much of Clinton's huge lead among those influential members of the Democratic Party. Like Sanders, Merkley is one of the most progressive members of the chamber. The two senators have worked together on legislation to restrict development of fossil fuel production and promote clean energy. Merkley's endorsement could be important as Oregon holds its Democratic presidential primary on May 17, with 74 delegates up for grabs.